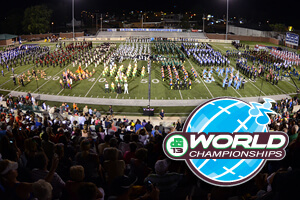 All 14 corps from Monday's Open Class Semifinals will perform at the Open Class World Championship Finals Tuesday, Aug. 6 in Michigan City, Ind. Since Taipei Yuehfu competes as an International Class corps, 13 corps will advance to the Finals competition on Tuesday, seeded in reverse order of Semifinals finish. The corps not advancing from the Semifinals, Blue Saints, will also have the opportunity to perform Tuesday in exhibition. Central time zone. All times approximate and subject to change. All 14 corps listed above will also have the opportunity to compete beginning Thursday, Aug. 8 in Indianapolis during the World Championship Prelims at Lucas Oil Stadium. View the World Championship Prelims lineup. View a complete schedule of 2013 World Championship events.